One thing I miss about living in Florida is the over abundance of Iced Tea at almost every restaurant, it just isn't something you come across very often in Perth. Usually restaurants offer you the choice of Sweet or Unsweetened, of course unsweetened is so much better for you, but Sweet Iced Tea with the copious amounts of sugar just tastes soooooo good. But now that I am cutting down the sugar in my diet I no longer can justify sweet tea, and I hate all the artificial sweeteners as well. I actually have a really hard time even drinking soft-drink (soda) at all anymore, it has actually tastes pretty gross to me now. 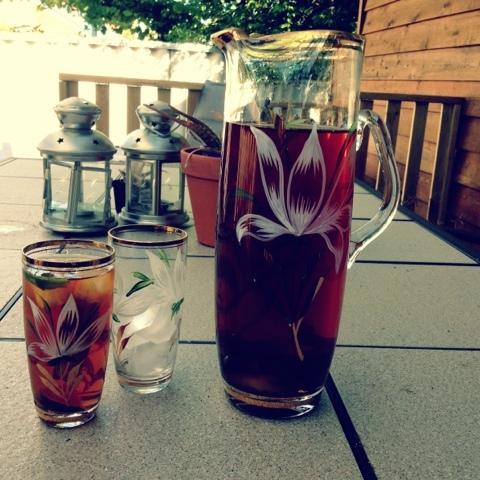 The weather in Perth got a bit nicer yesterday, and the sun was shining, and I got a craving for some Iced Tea. We have a massive bunch of mint in the fridge that needed to be used, and a couple of limes lying around, so they made the perfect addition to my tea. No need for sweeteners, the flavour was perfect and really refreshing. 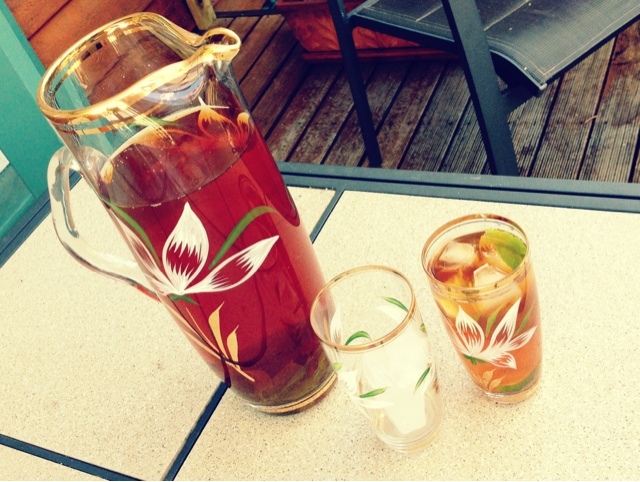 9 comments on "Mint and Lime Iced Tea"
This is a wonderful idea! I have to confess to drinking to much sweetened iced tea lately. Can I ask - what type of tea did you use as a base? Just normal black tea? 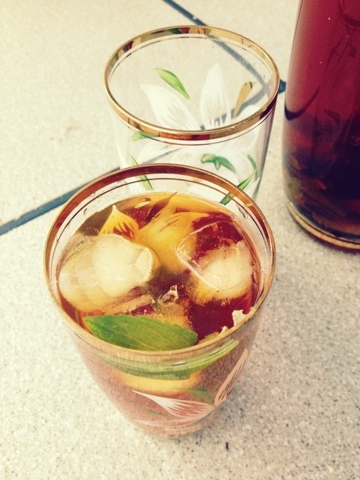 Do you do solar iced tea? I swear it tastes better...like it has sunshine in it. I just put some tea bags in a jug of water and add mint or orange or whatever and then let the sun do it's thing! I've never been able to get on board with iced tea, but maybe I've never had it made well? I like green tea cool and lipton's peach iced tea. This mint and lie is definitely one I want to try now . Especially since I stopped drinking alcohol . I've recently bought stevia drops to try too. Yep just regular black tea bags, I think I put 4 in, but depends how strong you want it! I didn't really know about it until my husband told me about it, then he made what he calls 'meadow tea' today, which was just sitting water in a jar with a bunch of mint leaves, adding a bit of sugar and it was great!! So minty and nice! Ice tea is something I missed a lot too when I first made the move from Singapore to Sydney. How strange that it's not available in Maccas here! Your iced tea looks delicious and so refreshing.